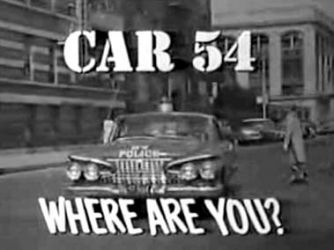 Martin Grams: The Cars on CAR 54, WHERE ARE YOU? The Cars on CAR 54, WHERE ARE YOU? Since the Car 54, Where Are You? television series is now out on DVD commercially, it seems only fitting to revisit the series through the popular hobby of automobile collecting. At a recent car show (my wife is into cars), we saw a replica of one of the cars from the television series on display. But the owner was trying to pass it off as an original. Little did he know that the biggest tip-off was the color on the outside of the car. Yes, within seconds it was clear that he had a replica. The use of automobiles in each episode, naturally, had to be cleared with the manufacturer for trademark legalities. After a number of phone calls and letters exchanged between Arthur Hershkowitz, the Vice President Eupolis Productions, and Byron Avery, Manager of the West Coast promotion office of Chrysler Corporation during the month of May, the Chrysler Corporation drew up a contract (dated June 5, 1961) in agreement with Eupolis Productions, Inc. The contract stated quite clearly that Chrysler would furnish, for approximately one year from the date of delivery, four automobiles for the use of the series. In return, Chrysler received substantial promotion during the closing credits. Hershkowitz also agreed to periodically furnish the automotive corporation with publicity stills showing Chrysler’s cars in use so the corporation could use them for promotional purposes. Eupolis Productions registered the cars in their name, paying for the costs, and agreed to hold Chrysler harmless from any Federal, State or local excise, sales or use of other taxes which could be levied as a result of the transfer or use of the vehicles. Chrysler was also held harmless for any damage to property or injury to people (including death), arising out of the possession or use of the vehicles. Eupolis also provided, at their expense, insurance coverage. A policy was taken for $50,000/$250,000 bodily injury, $100,000 property damage, and $50 deductible collision insurance. A copy of that insurance policy was forwarded to Chrysler so the corporation could feel assured that they were held free of any liability as a result of the television production. Regarding number four above, this was a 9-passenger Sport Suburban used not for on-camera filming, but for the transportation of cast and crew to various locations in New York. If production for the first season was made possible with four vehicles, then it begs the question: “Why three additional vehicles?” The answer was simple. Nat Hiken wanted the 1962 Chrysler New Yorker (No. 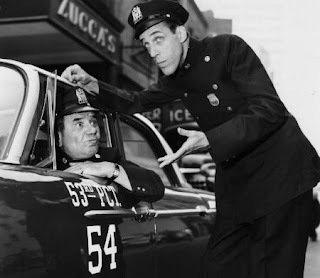 7 above) for personal use as a fringe benefit for the hard work that went into the day-to-day production of Car 54. The automobile was under Eupolis Productions’ insurance policy, and had to be returned within a year of the vehicle’s initial delivery. This fringe benefit was carried over for both Joe E. Ross (No. 3) and Fred Gwynne (No. 5), so the actors could commute to work. 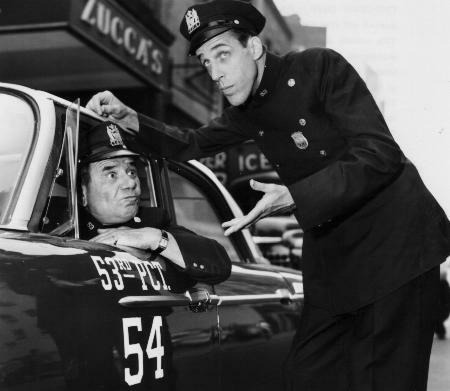 Car number 6 was issued to Duke Farley, who played Patrolman Reilly on the series - also a fringe benefit. The first two vehicles (Nos. 1 and 2), the red and white Plymouth Belvederes, were used as background props for all garage scenes, and whenever it was called upon for location shots. These are the very automobiles used as police cars in all of the requisite scenes filmed for the second season episodes. Car number 4 substituted the Sport Suburban used during the first season, so equipment, cast and crew could be transported to locations in New York. A similar agreement between Eupolis Productions and General Motors granted the permission (and furnishings) of a 1962 Chevrolet Sedan to be used as a prowl car for a number of episodes. This fact was disclosed to the West Coast Promotion Manager of Chrysler, who had no objection to the use of a competitor’s product in the episodes. General Motors also supplied a 1962 Greenbriar Convar for J.C. Delaney, set decorator for the series, to be used for productions (though this car never appeared on screen in any of the 60 episodes produced). Cars numbered one, two and seven were police cars used for onscreen filming. The convertible was a fringe benefit for actor Joe E. Ross. Car number five was a fringe benefit for Fred Gwynne. Car number nine was a fringe benefit for Nat Hiken, replacing the 1962 New Yorker he had “borrowed” for the past year. Car number four was labeled as the “pick-up car” and number eight was labeled as the “props car.” Car number six was featured on the final few episodes of the second season, as well as the detective’s car. For legal purposes, license plate numbers of real vehicles caught on camera were not allowed to be captured on screen, for fear of liability from a non-member of the production. However, Eupolis Productions did arrange with the state of New York to acquire a number of license plates that were authentic, and could be featured on camera. These plates were often reused on multiple cars lent to the production from Plymouth. 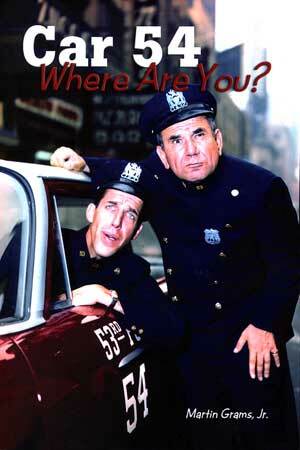 This blog post features excerpts from Car 54, Where Are You? by Martin Grams, available from Bear Manor Media. For more information, visit www.MartinGrams.com. What was the round device mounted to the dash board of Car 54? Was it a clock? A speaker? Unknown: I cannot say for sure but that may have been a calibrated speedometer for enforcement purposes. I believe the California Highway Patrol used such devices. I was amazed how many viewers never noticed that the shot through the windshield of Toody and Muldoon had the rear windows of a Chevrolet. I was a car buff and noticed it immediately. As the article stated, the Chevrolets were never shown themselves, but take it from me when you see the front view of the two in the patrol car, they are sitting in that Chevy. The round object on the dashboard was a calibrated analog speedometer. Made by Stewart Warner, it was called a "Police Special" and was used when "pacing" speeding offenders when not using radar, which was not in every patrol car in 1961. It was usually recalibrated once a year and certified so it could be used as proof of speeding in court.